Schedules are used to define Maintenance and Alerts that are repeated during the week. 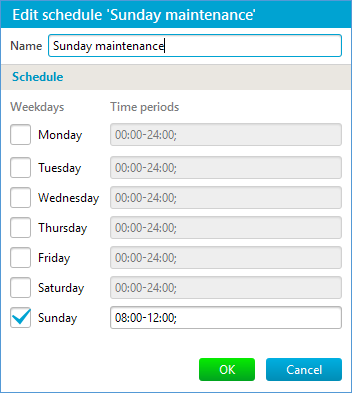 A schedule can be assigned to a host to define its Maintenance period. A schedule can be assigned to a simple alert to define its repeating pattern. You can create a new schedule, modify or copy an existing schedule, or remove a schedule on this page. Click the OK button to save the schedule. Now it can be used to specify a host maintenance timeframe or simple alert timeframe.